To add another Requiem to the hordes of famous works illustrating the script of the Death Mass ! Madness ? … or a challenge ? The specifications demanded by the sponsor Alain Lyet could be considered as a source of frustration or a source of stimulation: from the « primal scream » - in other words: a surge of primal energy before eternal fears - to the motley group of instruments imposed by the facilities available on the chosen venue for the first performance, the mounting demands seemed to conspire against the idea of a conventional representation. 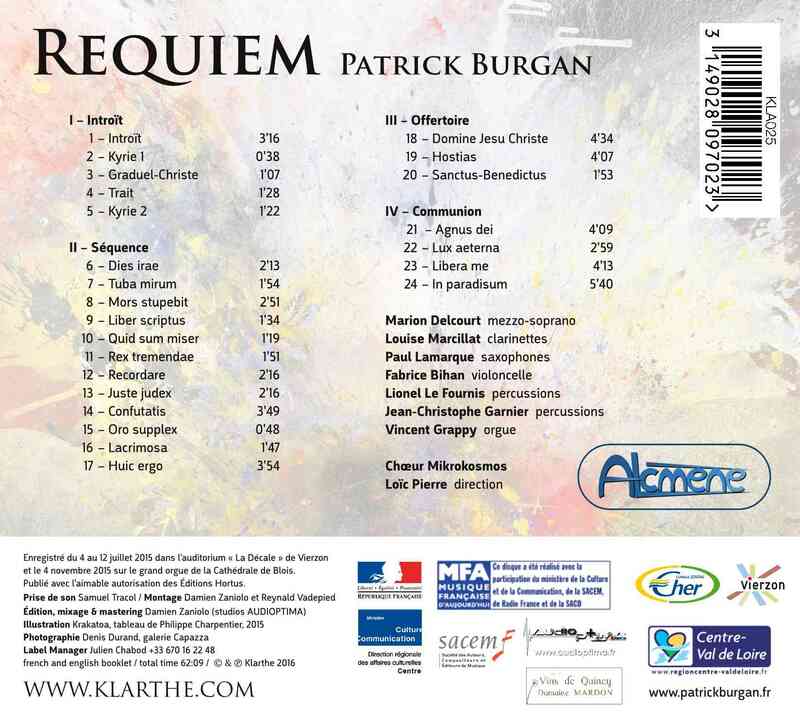 It would be to misunderstand Patrick Burgan to fail to recognise his motivations behind such a challenge: what is more, he is a discerning reader of scripts which fire his inspiration: the profanity in his vocal works are made up of masterly interpretations of chosen poems, his religious compositions explore complex polyphonies (Nativités) or create spellbinding atmospheres (Audi Coelum, Tristis) which unveil words engraved in our Christian heritage. 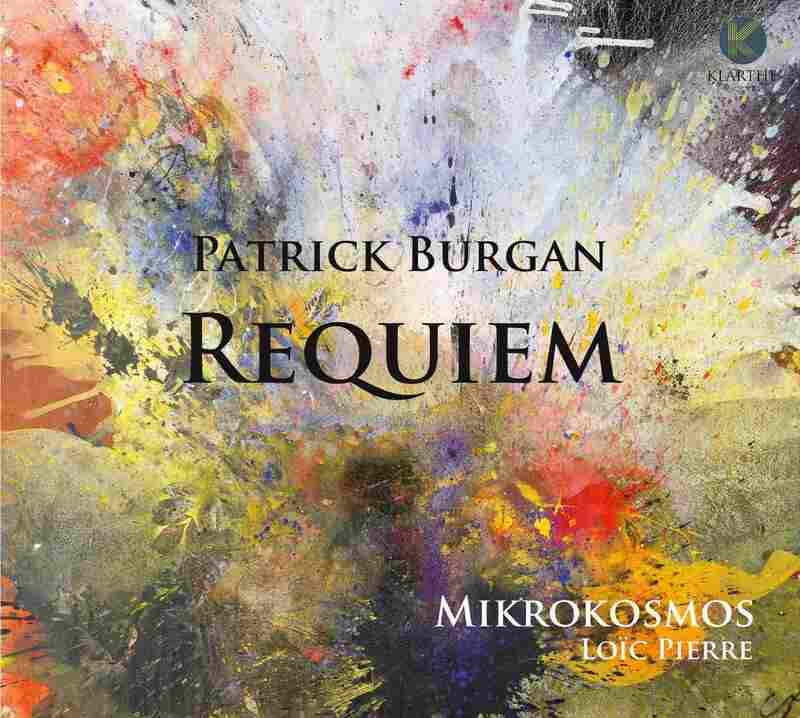 So having made the choice of a Requiem to meet the demands of this unusual commission, the different roles were distributed to convey the raw emotions that the question of death has evoked since the beginning of time: collective voices representing fear-stricken humanity in search of forgiveness, release instinctual energies which reach out to our innermost feelings. In contrast the pure melodic sound of the female soloist's voice rings out to represent the freed soul's aspirations on this journey towards eternal rest. As for the few solo instrumentalists allowed - a strange hotchpotch: a clarinetist also playing the small clarinet, a saxophonist covering the instrumental family from baritone to alto, two percussionists, a cellist and an organist backed ad libitum by a double bass player – to add the splashes of colour to the canvas which arouse our senses in the interpretation of this remarkable script.